I am passionate about stone. Stone carving, stonemasonry, letter cutting are all feeding my creativity. I use Cornish Granite, local Serpentine, Polyphant (cornish soapstone), pebbles, sandstone, limestone etc…. But i also work with antlers, horns, feathers, wood, often mixing them together in a truly unique piece. I had the chance to learn what i am doing with talented individuals such as Bernard Arin (calligraphy, typography) Rodolphe Giuglardo (Calligraphy, Letter cutting), Baz Mehew (stone carving), Richard Holiday and Brad Steele (stonemasonry) and most recently Tim Marsh and Ernie (granite masonry). 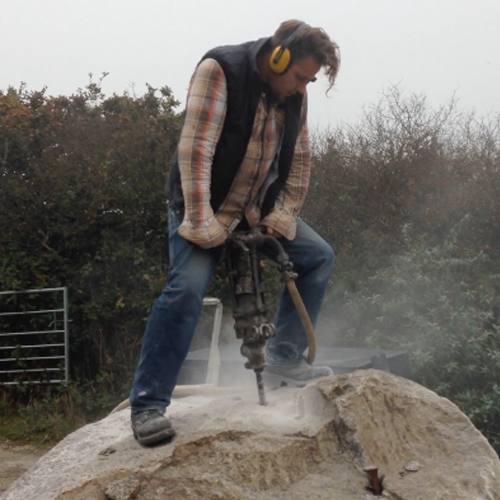 I am currently using all my skills to their full potential while still improving and learning new ways to apply them in different medium, like the local Cornish granite. Please contact me if you want bespoke stone feature, garden water feature like birdbath, Japanese stone basin (Chozubachi) in granite or else, a truly bespoke hand-written and hand-carved house sign, a quotation carved for the house or garden, a gift for someone or yourself… Initials or logo on pebbles… Native american peace pipe (calumet) or fetishes (Zuni and inuit inspired)… there is no limit to what can be done (except mine! ).